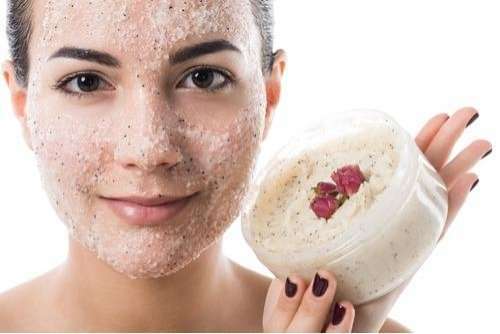 In this post you will find what’s the difference between chemical & physical exfoliants, their advantages, disadvantages and which is better for your skin. Exfoliation is a process by which you can slough off the older dead cells from the skin’s outermost surface. It helps to maintain your skin looking healthy and young. As you age, the skin-cell turnover rate gets slower. You can overcome this problem by exfoliating the skin. Otherwise also, whatever your age may be this skincare step will benefit your skin texture, tone and complexion. You can exfoliate your skin by using two different techniques – that is physical exfoliation and chemical exfoliation. Basically, both of them do the same thing—remove dead skin cells – but the processes involved are totally different. Whether you use a chemical exfoliant or physical, both help your skin slough off dead skin cells more quickly on its own. Though the chemical exfoliation sounds somewhat harsher than physical exfoliation, but actually it is rather the gentler of the two options. Read on here to learn why this is so. (ii) Face and Body Brushes. These could be manual or battery-powered. Tip: While choosing a physical exfoliant, always read the ingredient list to ensure that the exfoliating agents are not too large. Natural Beauty Tip: If you use a physical exfoliant like brush, sponge or cloth, make sure to clean them regularly. The dead skin removed during exfoliation is the ideal breeding ground for bacteria, particularly when damp. It’s important that you clean the exfoliating tools weekly & keep them in such a place where they can dry out quickly. Most of the people have heard of physical exfoliants, but only few of them are familiar with chemical exfoliants. The chemical exfoliants contain mild acids or enzymes. When chemical exfoliants or peels are applied onto the skin, they gently dissolve the ‘glue’ that binds dead skin cells together – thus speed up the cell turnover. They not only are good for smoothing but also great for brightening the skin. Whereas physical exfoliants essentially require scrubbing, the chemical exfoliants that contain acids or enzymes involve no such thing. The chemical exfoliants usually are gentler and milder than scrubs. That’s why they are preferred over the physical exfoliating products in case of skin types that are prone to dryness, sensitivity, acne, eczema and rosacea. Unlike a physical exfoliant that works only on the outermost skin layer, the chemical exfoliant besides working on the top layers also penetrates and work on layers that are not visible to the eyes. This quality makes the chemical exfoliants long lasting. (iii) Continues to work even after you finish the procedure.